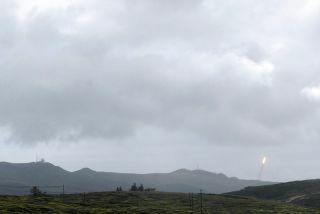 An Orbital Sciences Minotaur 4 Lite rocket, the first of its kind, launches on April 22, 2010 from Vandenberg Air Force Base in California in this image. Commercial companies are ready to take on more of thegovernment's space needs, and more encouraged now that President Barack Obamahas detailed his vision for future American spaceflight. Space industry leaders said this month that they are readyto transport cargo and crews to low-Earth orbit, as well as taking on moreEarth observation work and communication satellite operations. The meeting was held at the 29th National Space Symposium inColorado Springs, Colo., shortly before Obama's April 15 space policy speech inFlorida, which highlighted a new NASA proposal to rely more heavily oncommercial spaceflight abilities, revive the agency's cancelled Orionspacecraft and send astronauts to a nearby asteroid by 2025 before moving on toMars in the 2030s. One of the most high profile opportunities for privatecompanies to take over government work is the transportation of astronauts tothe International Space Station. In his newplan for NASA, President Obama has pushed for the commercial sector to developspacecraft to carry crews to the orbital laboratory. A number of companies,including the Space Exploration Technologies Corporation (SpaceX) and OrbitalSciences Corporation, have said they are potentially interested. "We certainly can find a way to get humans safely tolow-Earth orbit," said Gwynne Shotwell, president of SpaceX. That company has already successfully won a NASA contractfor $1.6 billion to transport cargo to the space station aboard its Dragon spacecraftand Falcon 9 rocket. Another firm, Virginia-based Orbital Sciences, is buildingits own Taurus 2 rockets and unmanned Cygnus spaceships in a $1.9 billioncontract to haul supplies for NASA as well. Because of NASA grants to develop these spacecraft, Shotwellsaid her company was able to successfully design a system that is now bringingin revenue beyond just its NASA work. SpaceX has already booked 32 flights onits Falcon9 booster and seven launches of its smaller Falcon 1 rocket, she said. The first Falcon 9 rocket is targeted to launch on a testflight on May 8. "There's no question that we've found success in themarketplace largely because of the investment that the government has provided,"Shotwell said. Many commercial players are encouraged by the increasedfunding for private industry space ventures in the 2011 NASA budget proposal. "Orbital is a very strong supporter of NASA's newdirection that includes a component that focuses on commercialcrew opportunities," said Dave Thompson, Orbital co-founder and CEO. Orbital has also won a NASA contract to provide eight futureunmanned cargo delivery flights to the space station on its Cygnus spacecraftand Taurus II rocket. The company is considering transforming aspects of thissystem to carry humans. And besides NASA needs, there are other avenues for possiblecommercial and government collaboration in space, industry leaders said. "There are many areas where this model has started towork out a little bit and could prove to work out even more," said JoshHartman, a senior fellow of Technology & Public Policy at the Center forStrategic and International Studies in Washington, D.C. He cited fields such asspace weather forecasting and space debris monitoring as possible fields wherethe industry could pitch in even more than it already is. "The time is right to do this," said Craig P.Weston, president and CEO of U.S. Space LLC, a company that provides satellitecommunications to the military. "The government really needs to take fulladvantage of the commercial sector."